Hear about invasive species from the experts! Emerald ash borer, an invasive forest pest, has been detected in Winnipeg. Regulations are in place to prevent its’ spread. In December 2017, emerald ash borer (EAB) was detected for the first time in Winnipeg, Manitoba. This is the most northerly detection of EAB in North America to date and most westerly in Canada. EAB was previously detected in Thunder Bay, in June 2016 – 700km east of Winnipeg. EAB is an invasive wood-boring beetle, native to parts of Asia. It was detected in the Detroit, Michigan and Windsor, Ontario areas in 2002, but likely existed undetected in North America since the 1990's. Experts believe the EAB was accidentally introduced to Detroit hidden inside wooden packaging materials or shipping crates. Since its arrival, the EAB has spread rapidly across North America with devastating consequences for the ash tree population. EAB has killed up to 99% of ash trees in its path and continues to spread in North America wherever ash trees are present. In response to the Winnipeg detection, the Canadian Food Inspection Agency (CFIA) has imposed regulations to slow the spread of EAB. Effective immediately, the movement of ash materials, including logs, branches and woodchips, and all species of firewood from Winnipeg is restricted. 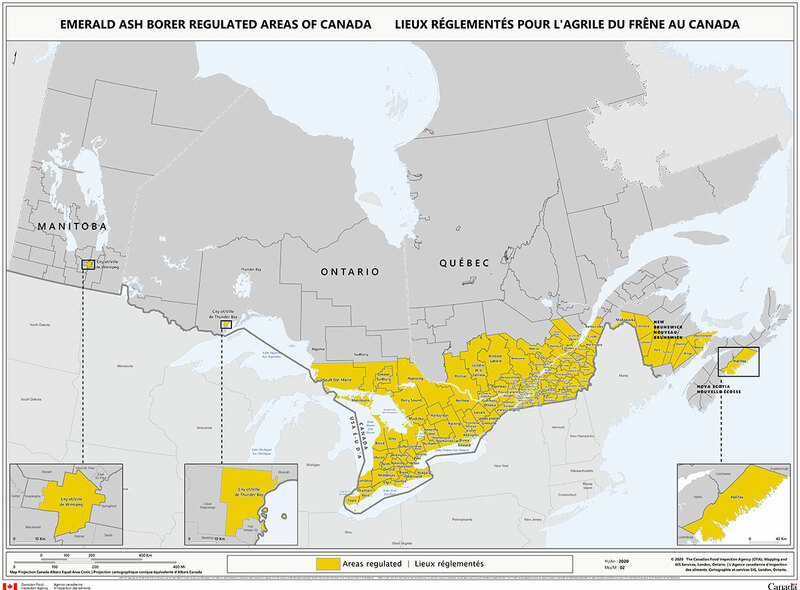 For more information on EAB regulations in Manitoba, visit the CFIA website.